With Thanksgiving around the corner, you may be looking for some lighter dishes to put on the dinner table for your family. As I’ve mentioned in the past, I’m a big believer in the “cook once, eat twice” philosophy of cooking- I like to cook enough of an ingredient to last for two meals and then transform the leftovers into a completely different dish on another day. It’s a big time-saver and your family won’t be bored eating leftovers. Not only is this salad healthy and easy to make, it’s also a great way to use up leftover butternut squash. To learn all about the nutritional benefits of this power food, CLICK HERE. Packed with fresh greens tossed in a maple dijon vinaigrette and topped with sweet butternut squash, dried cranberries, toasted pecans and a sprinkling of tangy goat cheese, this salad will make you feel like you’re overindulging even though you’re not. I like to use a mixture of peppery baby arugula and mild baby spinach but feel free to use your favorite salad greens. Toss the butternut squash with the thyme and 1 teaspoon olive oil on a baking sheet. Season the squash with salt and pepper and spread it out in a single later. Roast in the oven for 20 minutes, then flip the squash over and cook another 10 minutes until fork tender. Turn the oven down to 350 degrees. Spread the pecans on a baking sheet and toast in the oven until fragrant, 6-8 minutes. Remove from oven. While the squash and pecans are cooking, whisk the vinegar, maple syrup, mustard and remaining 5 teaspoons olive oil together in a small bowl. Season the vinaigrette with salt and pepper. Place the arugula and spinach in a salad bowl and toss with the dressing. 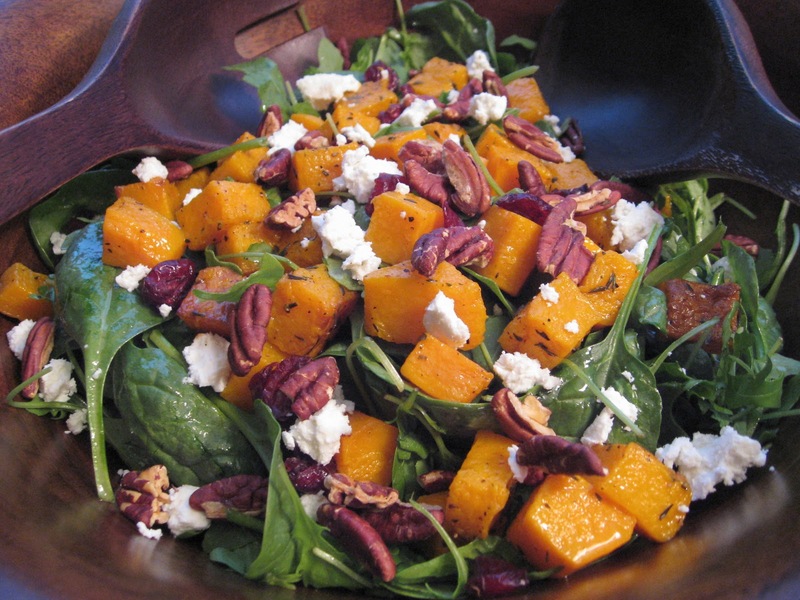 Arrange the roasted squash, pecans, cranberries and goat cheese on top. Enjoy! Beautiful! I Stumbled your post and I am a new follower–have enjoyed watching your contest wins. Wow, I'm making it for my wife's birthday dinner! Wow! Amazing dish…was a hit at Book Club! Can't wait to try more of your great recipes! I love salads but have never tried adding butternut squash in it. I am definitely going to try this recipe.Pictures are great. A really delicious salad,that also looks beautiful on the plate. I had this along with the stuffing referenced in an earlier post and it was an amazing pre-Thanksgiving treat. So simple and delicious! Another winner. 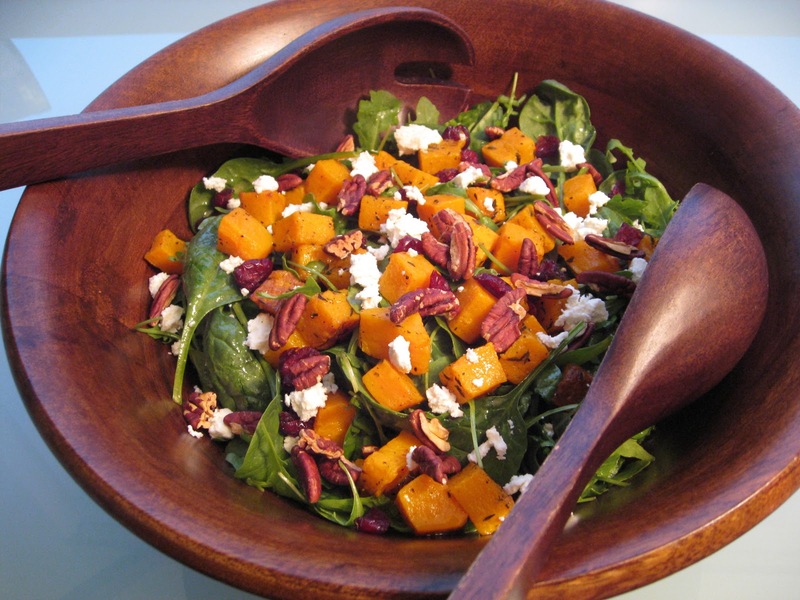 The arugula and spinach mixture enhances the flavor of the goat cheese nicely and with the addition of the butternut squash and cranberries the salad has a delicious tangy-sweet taste. A pretty presentation as well. Do you use real maple syrup? Yes, you'll definitely get better results with real maple syrup. I love this squash year around. Fantastic idea to put it in a salad. This has become my husband's favorite non-routine salad. I will take this salad anyday for lunch or with dinner. Love the roasted squash flavor. I heard about your blog through a mutual friend, and let me just say that I am NOT a cook! I am also a busy physician and usually too tired at the end of the day to cook! Anyway I tried this salad and it was SO delicious! I've lived in my apt for a year and today was the first day I used my oven! Thank you for the inspiration! Thanks so much for your comment, Nisha! I'm so happy to hear that you liked the recipe (and congrats on using the oven!). I know what you mean about being too tired to cook after work so I try to keep most of my recipes simple and quick to prepare. Then on my days off I make the longer, slow-cooked dishes. I hope you keep cooking! Looks delicious. Do you have a calorie count and nutrition information for this recipe? I've made an adaptation of this gorgeous salad for this month's Recipe Redux. We loved it!